The Hotlist, Quito-Swing Original Monks-Be Monk! Quito’s diverse Musical and cultural hotspots are constantly changing and growing. The local music scene which just a few short years ago consisted of a lot of death metal, has now been over-run with fun-loving, original, 10 piece bands rocking the house both far and wide. 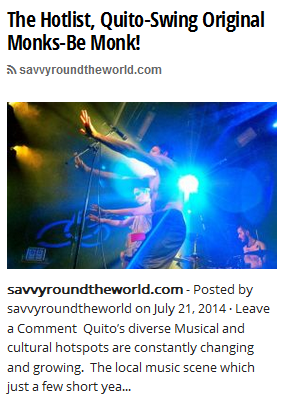 Check back with this blog weekly to find out more about the scene with the hotlist, Quito. Swing Original Monks are a genre unto themselves. The band at times is camp but the music is a tight fusion of swing, jazz, bluegrass, conga and whatever else they feel like throwing in during the moment. Baseline’s bounce and jump, guitar riffs wander and come pounding back while the drums keep the beat with the rest of the band setting up the moment to pounce.